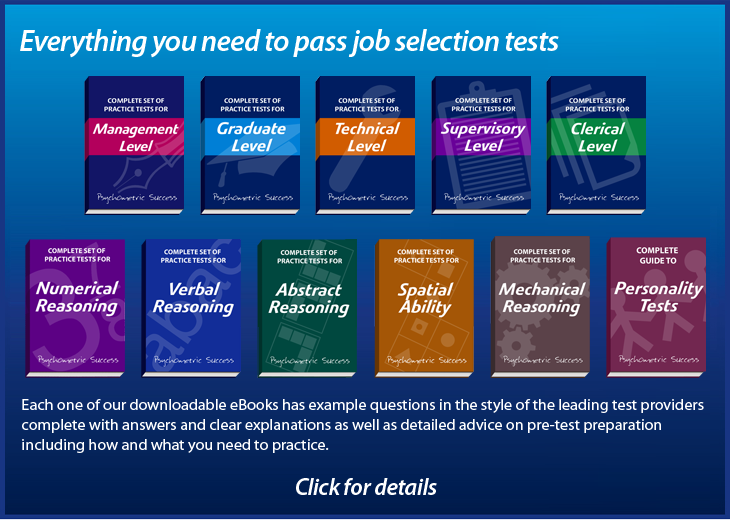 There are at least 5000 aptitude tests on the market at the moment. The types of question you can expect will depend on which aptitudes and abilities that are needed in the job you are applying for. Aptitude and ability tests are classified as maximum performance tests because they test what you can achieve when you are making maximum effort. There are two different styles of maximum performance test; speed tests and power tests. In a speed test the scope of the questions is limited and the methods you need to use to answer them is clear. Taken individually, the questions appear relatively straightforward. Speed test are concerned with how many questions you can answer correctly in the allotted time. A power test on the other hand will present a smaller number of more complex questions. The methods you need to use to answer these questions are not obvious, and working out how to answer the question is the difficult part. Once you have determined this, arriving at the correct answer is usually relatively straightforward. Below are the sales figures for 3 different types of network server over 3 months. In which month was the sales value highest? What is the unit cost of server type ZXC53? Speed tests contain more items than power tests although they have the same approximate time limit. Speed tests tend to be used in selection at the administrative and clerical level. Power tests tend to be used more at the graduate, professional or managerial level. Although, this is not always the case, as speed tests do give an accurate indication of performance in power tests. In other words, if you do well in speed tests then you will also do well in power tests. These speed and power definitions apply only to maximum performance tests like aptitude and ability tests and not to personality tests.